While individual research awards can be used to cover the direct costs of research, such as certain salaries, equipment, and supplies connected with a project, research institutions must bear the increasingly high costs of supporting their overall research activity with appropriate facilities, academic research resources, researcher salaries, management and administrative personnel, oversight of regulatory compliance and accreditation, and intellectual property management. Maintaining and Enhancing Qualtrics Software Institutional License: Qualtrics is web-based, research survey software that offers many advanced, but user-friendly, features. Qualtrics enables users to do surveys, get feedback, and conduct polls using a variety of distribution means. Qualtrics is cloud-based software and has proven to be a versatile resource for our researchers. The company has recently migrated the servers available to University of Winnipeg researchers to Canadian sites to enhance data security. Vivarium: The University of Winnipeg Vivarium occupies a 7500 square foot space for keeping and raising traditional model organisms (e.g., rodents, fish) and wildlife (e.g., bats, wild rodents) for research. The complex houses an Aquatic skid, three fish housing systems, and one living stream. Rodent equipment includes a Cage Washer with access to a clean and dirty side, ventilated lab bench, change station, operating room, and both mouse and rat housing systems. The vivarium includes a wildlife facility designed to house bats with two large flight rooms and procedure space with biosafety cabinet for studies of behaviour, physiology and infectious disease. While housed in the Vivarium the animals are monitored every day by the technicians (weekends and holidays as well). The research ranges from nutritional studies to aquatic ecology and physiology, evolutionary biology and endangered species conservation. Library: The Library has focused on sustaining resources responsibly through assessment and increased dialogue with faculty about their needs in the short and long term. As the currency exchange remains high and the cost of resources continue to rise, the Library has undertaken a subscription review project, and we continue to make strong, evidence-based decisions. The Library continues to support Open Access initiatives like Erudit and Scoap3. These investments benefit the UW community by promoting trustworthy and respected open access resources to our faculty and students. Our Scholarly Communications office has undertaken a number of initiatives this year. We continue to make platform improvements to our Institutional Repository, WinnSpace, to which we recently added our 1000th item, and have made increased connections with faculty to increase growth. We look forward to adding DOIs, and metrics badges to the WinnSpace interface in the future, and exploring an integrated Current Research Information System for next year. We work on an ongoing bases with the the Research Office to pull together University-wide knowledge sharing and mobilization initiatives. We are developing a strategy, in partnership with other campus nodes, for Research Data Management, and we have created an RDM web page and provided personalized support to faculty for Tri-Agency applications. The Library provides in-kind support for research grants: lit reviews, RDM support, Open Access advising. We have also formed an Ad Hoc committee on indigenous knowledge stewardship protocols. Looking ahead to 2018-19 the above initiatives will continue and be strengthened. The Library will also continue working more closely with the Research Office and Technology Solutions Centre to build capacity for the storage, management, archiving and dissemination of research data in keeping with evolving Tri-Council guidelines. Financial Services Upgrades: The University continues to offer on-line and personal training for users of the recently installed financial system, Microsoft Dynamics NAV and new reporting software, Prophix. Award functionality includes multi-year reporting with enhanced non-financial information attached. Researchers have instant access to their award balances and reporting tools designed to improve analytical abilities. Continual upgrades are resulting in faster, more accurate, and more efficient services for researchers and research administration staff. Research accounting personnel are thus able to handle the increasing volume of research grants awarded with enhanced ability for financial analysis and reporting. Research Support: The Research Office continues to maintain the position of Senior Advisor, Research and Sustainability on a .75% basis to increase the University’s capacity to fulfill its 5-year Integrated Academic & Research Plan (IARP), which was developed in consultation with members of the University community. As the University’s research funding in the past decade has nearly tripled, the University of Winnipeg’s goal is to strengthen our capacity to provide relevant research support to faculty members. To this end, a faculty survey and a set of focus groups were conducted in order to gather information on ways in which the Research Office can better support researchers while maintaining its capacity to develop and administer increasing numbers of successful grant applications. In 2003 the Federal Government introduced the Indirect Costs of Research Program (ICP) to provide grants to Canadian universities and colleges to offset the financial challenges of administering Tri-Agency funded research. The Research Support Fund replaced the Indirect Costs Program as of May 25, 2015. The program is part of the federal government’s strategy to make Canada one of the world’s top countries in research and development. It currently has a budget of $369 million and serves 125 postsecondary institutions across the country. Every year, the federal government invests in research excellence in the areas of health sciences, engineering, natural sciences, social sciences, and humanities through its three granting agencies. The Research Support Fund reinforces this research investment by helping institutions ensure that their federally funded research projects are conducted in world-class facilities with the best equipment and administrative support available. What costs does the program support? Administrative costs associated with getting a patent for an invention. 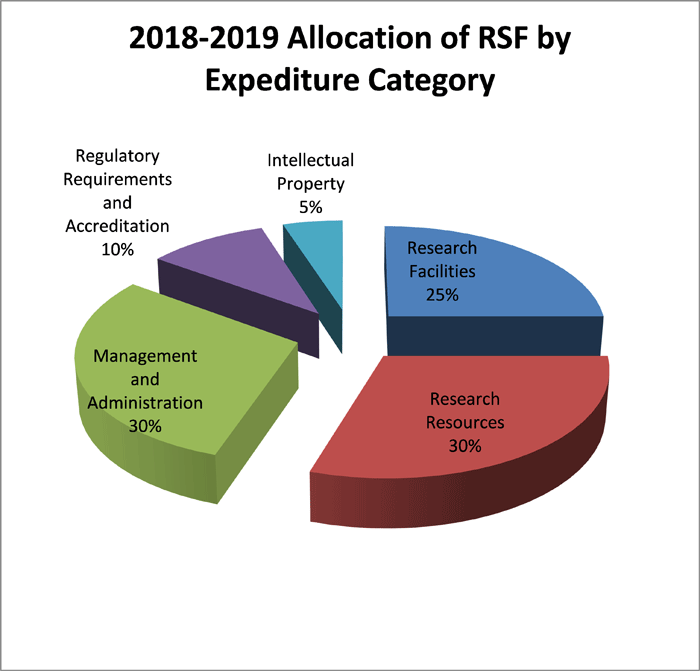 RSF grants are allocated annually, based on a rolling average of the Tri-Agency funding awarded to the institution over the previous three years. In 2017-2018 The University of Winnipeg incurred eligible costs of approximately $2,000,000 in support of Tri-Agency funded research activities. The total RSF grant awarded for that year was $$1,021,466, off-setting approximately half of these eligible costs. For 2018-19, the University of Winnipeg RSF grant will be $1,092,510, an increase of nearly 7% over the previous fiscal year. Research facilities: renovation & maintenance of research facilities, upgrades and maintenance of research equipment and other devices, operating costs, and technical support for labs, offices and other facilities. Research resources: acquisition of library holdings, improved information resources, library operating costs and administration, and insurance on research equipment and vehicles. Management and administration of the research enterprise: support for the completion of grant applications/research proposals, acquisition, maintenance and/or upgrade of information systems to track grant applications, certificates and awards, training of faculty and research personnel, human resources and payroll, financial and audit costs, research planning and promotion, and public relations. Regulatory requirements and accreditations: creation and support of regulatory bodies, relevant training of faculty and other research personnel, international accreditation costs, upgrades and maintenance of research facilities to meet regulatory requirements, technical support for animal care and handling of hazardous substances, and the purchase of animals exclusively for training purposes (not research). Intellectual property: creation, expansion or sustenance of a technology transfer office or similar function, administration of invention patent applications, support for technology licensing, administration of agreements and partnerships with industry, development of incubators, support for the creation of spin-off companies, certain public outreach activities, and marketing of teaching materials, scientific photo libraries, data sets, and other tools for knowledge transfer.